For over 15 years, foot surgeons all over the world have used DR Animator to simply and effectively illustrate complex Podiatric procedures to their patients. No other program offers the point-and-click simplicity in explaining as many procedures as DR Animator. 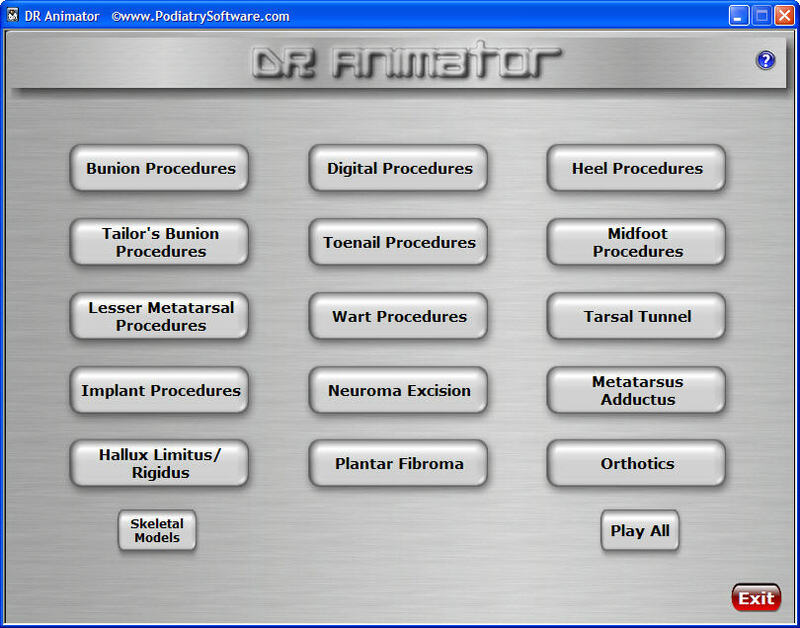 DR Animator helps your patients understand the nature of the planned surgery. Educating your patient leads to improved compliance and reduced fears. Using DR Animator, you can provide an in-service to the O.R. staff at your local Hospital or Surgery Center. As your staff becomes more knowledgeable, the level of patient care increases. Increase word-of mouth referrals as you impress patients with your high-tech approach to patient education. Showcase your surgical expertise at local health fairs and other public relations events using DR Animator. DR Animator has been featured on the ABC Television show "The View" where it was used to help demonstrate reconstructive foot surgical procedures and has been requested for use on "The Dr. Oz Show". 16 different bunionectomy animations, digital arthroplasties, digital fusions, lesser metatarsal osteotomies, hallux limitus surgery, tarsal tunnel, neuroma excision, toenail procedures, 1st MPJ implants, heel procedures, wart procedures, plantar fibroma excision, midfoot procedures, gait and orthotics demonstration and more!